Robert Joseph "Bob" Cousy (August 9, 1928 - ) is a former American professional basketball player who, as point guard with the National Basketball Association's Boston Celtics from 1951 to 1963, led the team to six NBA championships. 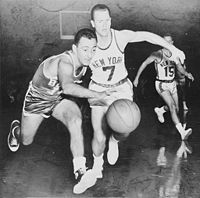 Born to French immigrants in New York City, Cousy first demonstrated his basketball abilities while playing for his high school varsity team in his junior year. He obtained a scholarship to the College of the Holy Cross and was named an NCAA All-American for three seasons. After joining the Celtics in 1950, Cousy became the world's premier point guard. He was elected to 13 NBA All-Star teams and 12 All-NBA First and Second Teams, also winning the NBA Most Valuable Player Award in 1957. In his first 11 seasons in the NBA, Cousy led the league in assists eight consecutive times and introduced a new blend of ball-handling and passing skills, earning him the nickname "Houdini of the Hardwood," and "Mr. Basketball." After his playing career, Cousy coached the Cincinatti Royals for several years and later became a broadcaster for Celtics games. He was elected into the Basketball Hall of Fame in 1971. Cousy was named as one of the 50 Greatest Players in NBA History in 1996. Cousy was born as the only son of poor French immigrants living in New York City. He grew up in the Yorkville neighborhood of Manhattan's East Side, in the midst of the Great Depression. His father, Joseph, was a taxi driver who had served in the German Army during World War I. Bob spoke French for the first five years of his life and only started speaking English when he began primary school. He spent his early days playing stickball in a multicultural environment, regularly playing with African Americans, Jews, and other children from ethnic minorities. These experiences ingrained him with a strong anti-racist sentiment, an attitude for which Cousy was well known during his professional career. Cousy took up basketball at the age of 13 and was "immediately hooked." The following year, he became a student of Andrew Jackson High School in St. Albans. His basketball success was not immediate, as he was cut from the school team in his freshman year. The next year, he was again cut during tryouts and also broke his right hand when he fell out of a tree. This forced him to play left-handed until his hand healed, to the point that he became effectively ambidextrous. A high school basketball coach became impressed by Cousy's ability to play with both hands, and he soon joined the junior varsity team as a result. By his junior year Cousy was set to join the varsity squad, but he failed his citizenship class and he was ineligible to play during the first semester. Cousy thus joined the team midway through the year, scoring 28 points in his first game on the varsity squad. In his senior year, Cousy led his team to the Queens division championship and became the highest scorer in the city. He was also named captain of the Journal-American All-Scholastic team. He soon received and accepted a scholarship offer from the College of the Holy Cross in Worcester, Massachusetts just 40 miles outside of Boston. Cousy was one of six freshmen on the Holy Cross Crusaders basketball team in 1947. However, he was disappointed with his lack of playing time and was criticized by the coach, who accused Cousy of being a show-boater because of Cousy's uptempo, streetball-like game, defined by ambidextrous behind-the-back dribbles and passes. Nonetheless, Cousy had enough playing time in games to score 227 points for the season, finishing with the third highest total on the team, which finished the 1946–1947 basketball season with a 24–3 record. Holy Cross entered the NCAA Men's Division I Basketball Tournament as the last seed in the eight-team tournament. The Crusaders went on to win the tournament, the first college from the New England to do so. However, in the championship game, Cousy played poorly, scoring four points on 2-for-13 shooting. The following season, Cousy's playing time was again limited, but his fate changed in a match against Loyola of Chicago at the Boston Garden. With five minutes left to play and Holy Cross trailing, the crowd started to chant "We want Cousy! We want Cousy!" until the coach relented. In these few minutes, Cousy scored 11 points and hit a game-winning last-second shot after a behind-the-back dribble. The performance established him on the school team, and he led Holy Cross to 26 consecutive wins and second place in the National Invitation Tournament. In his college career, Cousy would be voted a three-time All-American. In 1950, Cousy turned professional and made himself available for the NBA Draft when the local Boston Celtics had just concluded the 1949-50 NBA season with a miserable 22–46 record and had the first draft pick. It was anticipated that they would draft the highly coveted local favorite Cousy. However, coach Red Auerbach snubbed him in favor of center Charlie Share, commenting: "I'm supposed to win, not go after local yokels." The local press strongly criticized Auerbach, but other scouts were also skeptical about Cousy, viewing him as being flamboyant but ineffective. The Illinois-based Tri-Cities Blackhawks drafted Cousy with the third overall pick, but he was decidedly unenthusiastic about his new employer, not wanting to move to the small-town area of Moline, Rock Island, and Davenport, Illinois. Cousy demanded a salary of $10,000 from Blackhawks owner Bob Kerner, and when Kerner only offered him $6,000, Cousy refused to report. Cousy was then picked up by the Chicago Stags, but the team soon folded. League Commissioner Maurice Podoloff declared three Stags players available for a dispersal draft: Stags scoring champion Max Zaslofsky, Andy Phillip, and Cousy. Celtics owner Walter A. Brown was one of the three club owners invited, and rights to the players were determined by lot. Hence, Cousy became a Celtic, with Brown reluctantly giving him a $9,000 salary. It was not long before both Auerbach and Brown changed their minds about Cousy's worth. With an average of 15.6 points, 6.9 rebounds, and 4.9 assists per game in his rookie season, Cousy received the first of his 13 consecutive All-NBA Team call-ups. He also led the formerly struggling Celtics to a 39–30 record in the 1950-51 NBA season, although the Celtics were beaten by the New York Knicks in the 1951 NBA Playoffs. The next year, the Celtics added future Hall-of-Fame guard Bill Sharman in the 1951 NBA Draft. By averaging 21.7 points, 6.4 rebounds, and 6.7 assists per game, Cousy earned his first All-NBA First Team nomination. Nonetheless, the Celtics lost again to the Knicks in the 1952 NBA Playoffs. In the following season, Cousy made further progress. Averaging 7.7 assists per game, he won his first of eight consecutive assists titles. These numbers were achieved despite the fact that the NBA had not yet introduced the shot clock, which would later result and more score and thus more assists. Powered by Auerbach's fastbreak-oriented tactics, the Celtics won 46 games during the season and beat the Syracuse Nationals 2–0 in the 1953 NBA Playoffs. The final playoff game was one of Cousy's most memorable. It ended 111–105 in a quadruple-overtime thriller. Despite nursing an injured leg, he scored 25 points in regulation time and added six of his team's nine points in the first overtime, hitting a clutch free-throw in the last seconds. Cousy scored all four Celtics points in the second overtime period, and another eight in the third overtime, among them a dramatic, 82-foot buzzer beater. In the fourth overtime, he scored nine of the 12 Celtics points to seal the win. Cousy ended the game playing 66 minutes, scoring 50 points, and making a still-standing record of 30 free throws in 32 attempts in one game. In the next three years, Cousy firmly established himself as one of the best point guards of the league. Leading the league in assists again in all three seasons and averaging 20 points and seven rebounds per game, Cousy earned three further All-NBA First Team and All-Star honors and was also Most Valuable Player (MVP) of the 1954 NBA All-Star Game. Through these years, Cousy introduced an array of visually attractive street basketball moves to the game, including no-look passes, behind the back dribbles and feeds, an uncanny sense for the open man which he attributed to particularly good peripheral vision, and impressive long-range passing to set up fast-break scoring opportunities. Cousy's modus operandi contrasted with the rest of the NBA, which was dominated by muscular low-post scorers and deliberate, flat-footed set-shooters. Soon, he was called "Houdini of the Hardwood" after the magician Harry Houdini. Cousy's crowd-pleasing and effective play also drew a large attendance at the Boston Garden and completely won over coach Red Auerbach, who no longer saw him as a liability, but as an essential building block for the future. The Celtics were unable, however, to make their mark in the 1954, 1955, and 1956 NBA Playoffs, losing three times in a row against the Syracuse Nationals and forward Dolph Schayes. In the 1956 NBA Draft, Auerbach acquired three future Hall-of-Famers: Forward Tom Heinsohn, guard K.C. Jones, and defensive center Bill Russell. Powered by these new recruits, the Celtics went 44–28 in the regular season, and Cousy averaged 20.6 points, 4.8 rebounds, and a league-leading 7.5 assists, earning his first NBA Most Valuable Player Award. He also won his second NBA All-Star Game MVP award. The Celtics reached the 1957 NBA Finals, and with the combination of Cousy on offense and rugged center Russell on defense, they beat the St. Louis Hawks 4–3. In the 1957-58 NBA season, Cousy had yet another highly productive year, with an average of 20.0 points, 5.5 rebounds, and 8.6 assists per game, leading to nominations into the All-NBA First Team and the All-Star team. He again led the NBA in assists. The Celtics reached the 1958 NBA Finals against the Hawks, but when Russell succumbed to a foot injury in game three, the Celtics faded and bowed out four games to two. This would be the last losing NBA playoff series in which Cousy would play. In the following 1958-59 NBA season, the Celtics took revenge on their opposition, powered by an inspired Cousy, who averaged 20.0 points, 5.5 rebounds, and a league-high 8.6 assists a game, winning yet another assists title and another pair of All-NBA First Team and All-Star team nominations. Late in the season, Cousy reasserted his play-making dominance by setting an NBA record with 28 assists in one game against the Minneapolis Lakers. The Celtics stormed through the playoffs and, behind Cousy's 51 total assists (still a record for a four-game NBA Finals series), defeated the Minneapolis Lakers in the first 4–0 sweep ever in the NBA Finals. In the 1959-60 NBA season, Cousy was again productive, his 19.4 points, 4.7 rebounds, and 9.5 assists per game earning him his eighth consecutive assists title and another joint All-NBA First Team and All-Star team nomination. Again, the Celtics defeated all opposition and won the 1960 NBA Finals 4–3 against the Hawks. A year later, the 32-year-old Cousy scored 18.1 points, 4.4 rebounds, and 7.7 assists per game, winning another pair of All-NBA First Team and All-Star nominations. The Celtics won the 1961 NBA Finals after convincingly beating the Hawks 4–1. The only downside to the season for Cousy was his failing to win the assists crown after eight consecutive years as the league's assists leader. In the 1961-62 NBA season, the aging Cousy slowly began to fade statistically, averaging 15.7 points, 3.5 rebounds, and 7.8 assists, and was voted into the All-NBA Second Team after ten consecutive First Team nominations. Still, he enjoyed a satisfying post-season, as the Celtics won the 1962 NBA Finals after two closely fought 4–3 battles against two upcoming teams, the Philadelphia Warriors with Wilt Chamberlain and the Los Angeles Lakers with Hall-of-Famers Elgin Baylor and Jerry West. Finally, in the 1962-63 NBA season, the last of his career, Cousy averaged 13.2 points, 2.5 rebounds, and 6.8 assists, and collected one last All-Star and All-NBA Second Team nomination. In the 1963 NBA Finals, the Celtics again won 4–2 against the Lakers. At age 35, Cousy ended his playing career. The farewell ceremony in a packed Boston Garden became known as the Boston Tear Party, when the veteran point guard was rendered speechless after a 20-minute tribute that was only meant to be seven minutes long. Joe Dillon, a water worker from South Boston, Massachusetts and a devoted Celtics fan screamed "We love ya, Cooz," breaking the tension, and the crowd went into a frenzy of cheers. As a testament to Cousy's legacy, President John F. Kennedy wired to Cousy: "The game bears an indelible stamp of your rare skills and competitive daring." After retiring as a player, Cousy published his autobiography Basketball Is My Life in 1963, and in the same year, he became coach at Boston College. In his six seasons there, he had a record of 117 wins and 38 losses and was named New England Coach of the Year for 1968 and 1969. Cousy led the Eagles to three NIT appearances including a berth at the 1969 NIT Championship and two National Collegiate Athletic Association tournaments including a berth at the 1967 Eastern Regional Finals. However, he grew bored with college basketball and made his return to the NBA as coach of the Cincinnati Royals team of fellow Hall-of-Fame point guard Oscar Robertson. In 1970, the 41-year-old Cousy even made a late-season comeback as a player to boost ticket sales. Despite his meager output of a cumulative five points in 34 minutes of play time in seven games, ticket sales jumped by 77 percent. However, Cousy stepped down as coach early in the 1973-74 NBA season with a mediocre 141–209 record. In later life, Cousy was Commissioner of the American Soccer League from 1974 to 1979, and he has been a color analyst on Celtics telecasts since the 1980s. Today, he is a marketing consultant for the Celtics, and occasionally makes broadcast appearances with Mike Gorman and ex-Celtic teammate Tom Heinsohn. Cousy married his college sweetheart Missie Ritterbusch in December 1950, and they have been married for over 50 years. They live in Worcester, Massachusetts. Cousy was well known, both on and off the court, for his anti-racist attitude, a result of his upbringing in a multicultural environment. In 1950, when the Celtics played a match in the then-segregated city of Charlotte, North Carolina, teammate Chuck Cooper—the first African-American in NBA history to be drafted—would have been denied a hotel room. Instead of taking the hotel room himself, Cousy insisted on traveling with Cooper on an uncomfortable overnight train. He also publicly sympathized with the plight of black Celtics star Bill Russell, who was frequently a victim of racism. The Boston Celtics retired Bob Cousy's number 14 jersey. In his 13-year, 924-game NBA career, Bob Cousy finished with 16,960 points, 4,786 rebounds, and 6,955 assists, translating to averages of 18.4 points, 5.2 rebounds, and 7.5 assists per game. He was regarded as the first great point guard of the NBA, winning eight of the first 11 assist titles in the league. He led the Celtics to six NBA titles, and won one MVP award, 13 All-Star nominations, 12 All-NBA First and Second Team call-ups, and two All-Star MVP awards. The Celtics franchise honored his contribution to the team by retiring his number 14 jersey. Celtics owner Walter Brown said: "He made basketball in this town. If he had played in New York he would have been the biggest thing since [New York Yankees baseball legend] Babe Ruth. I think he is anyway." With his eye-catching dribbling and unorthodox passing, Cousy pioneered the modern style of guard play, and raising the profile of both the Boston Celtics and the entire NBA. In recognition of his feats, Cousy was inducted into the Basketball Hall of Fame in 1971. On May 11, 2006, ESPN.com rated Cousy as the fifth greatest point guard of all time. Cousy, Bob, and Devaney, John. The Killer Instinct. New York: Random House, 1975. ISBN 978-0394494692. Cousy, Bob, and Ryan, Bob. Cousy on the Celtic Mystique. New York: McGraw-Hill, 1988. ISBN 978-0070133327. Freedman, Lew. 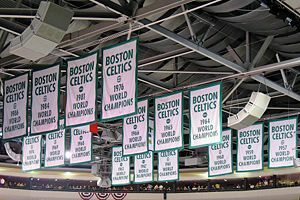 Dynasty: The Rise of the Boston Celtics. Guilford, CT: Lyons Press, 2008. ISBN 978-1599211244. Reynolds, Bill. Cousy: His Life, Career, and the Birth of Big-Time Basketball. New York: Simon & Schuster, 2005. ISBN 0-7432-5476-7. All retrieved December 17, 2016. This page was last modified on 17 December 2016, at 22:13.